Instance #179 of SCP-2898-B, prior to recovery and disposal. Special Containment Procedures: The house containing SCP-2898 has been purchased and placed under Foundation custody. The walls of the house must be inspected daily for new instances of SCP-2898-A. Motion sensors have been placed throughout the house to detect new manifestations of SCP-2898-B. Remains of SCP-2898-B instances are to be removed from the house and disposed of appropriately. Description: SCP-2898 comprises a series of structural anomalies occurring in a two-storey bungalow located at ██ ██████ Avenue in Georgetown, Penang. SCP-2898-A designates images of human bodies spontaneously appearing on the interior walls of the residence. SCP-2898-A has so far appeared in all types of surfaces, including bare concrete, plaster, wood, thick coats of paint, and in several cases, a rice paper screen in the master bedroom. Instances are initially vague and bear only a passing resemblance to a human face, but increase in clarity and contrast over the course of the next 5 to 6 days to form a clear image. Following which, instances of SCP-2898-A will gradually resolve into a complete image of a human body within 3 weeks. The wall section containing a complete image of SCP-2898-A will eventually produce an animate humanoid entity, designated as an instance of SCP-2898-B. All instances of SCP-2898-B appear to be constructed from common building materials (in particular, material similar to that of the wall surface they emerge from) and, on occasion, small amounts of human biological matter. A partial list of such entities has been appended below. All instances of SCP-2898-A and -B resemble PoI-5775 (Beatrice Cho), the former occupant of ██ ██████ Avenue. Cho was an artist known for her work with GoI-165 ("The Restoration Collective"), and frequently incorporated anomalous properties into her sculptures. She had been diagnosed with dementia in 1999 and was moved into a nursing home by her family 2 years later. While biological materials discovered in certain SCP-2898-B instances appears to have originated from PoI-5775, she remains in good physical health. 57 identical symbols drawn in Krylon-brand pink chalk are located throughout the interior of the building, largely concentrated on the north- and west-facing walls. PoI-5775 claims to be not responsible for creating SCP-2898, but contended in one interview that she could have easily forgotten doing so due to her condition. A possible link with SCP-474 is currently being investigated. Description: Assumed to have emerged from a concrete wall in the basement. Instance appeared to have backed away from the wall and curled itself into a fetal position underneath a table, where it eventually set. Instance was discovered upon original acquisition of the residence by the Foundation. 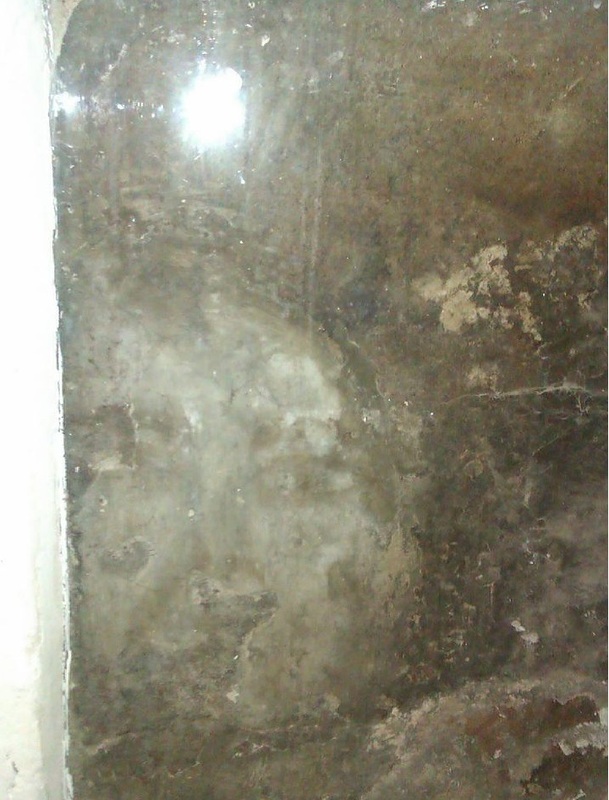 Description: Emerged from a wall in the master bedroom which had been heavily repainted in the past. Instance consisted of wet paint and approximately 45kg of human hair, later confirmed as belonging to PoI-5775. Immediately after manifestation, the instance began to frantically knead its face with both hands in an apparent attempt to reinforce its facial features. Instance solidified after 52 seconds. Description: Emerged from a tiled wall in the ground-floor bathroom. Instance was made of ceramic with crudely articulated ball joints. Immediately following its manifestation, the instance mimed the act of using a hammer and chisel for approximately 5 minutes before ceasing all activity. Description: Emerged from a wall in the studio. Instance consisted of wet plaster. It repeatedly picked up sculpting tools and walked aimlessly around the room, before setting completely after 4 minutes and crumbling into dust. Several strips of bleached cloth, along with fragmented bones of apparently human origin, were recovered from the studio floor following decomposition of the instance. The bones were identified as belonging to PoI-5775. Description: Emerged from the parquet panelling of a wall in the living room. Instance appeared to be made of wood and desiccated quickly in the span of 21 seconds. Throughout this time, instance appeared to be in a state of extreme disorientation and panic. A lacquered sheen was observed to spread over the instance after it stopped moving. Addendum-2898-02: Excerpts from handwritten notes collected in ██ ██████ Avenue. I suppose I would have complained that it isn't fair, but I've seen enough to know that nothing lasts forever. Even stone is flabby, pliable and mortal with the right set of tools. The follow-up is on Tuesday. Hannah is fetching me, since she has forbidden me to drive. We considered moving out, but an old woman alone in a house is not an easy thing to move. Plus, I would need to move the studio. Extra space is hard to create in a place that isn't yours. I opened up the studio for the first time in a while. While it's comforting to know that I still have the touch, it's strange to see how many pieces I don't remember making. Note to self - tag with time and date. One does not really feel oneself "go", in a sense. I am a series of comings and goings, leaving rooms only to enter them a minute later, forgetting what I forgot. Only the house remains a constant. Hannah says that there are too many rooms, that I am making a mess of the place, but I like it the way it is. I come and go and the rooms stay the same. I think they make me. Received a letter from an old friend in the States. I must have told them before, as they wish me well. I am strangely reminded of their work, back in the day - imprintings, infusions. Woodcuts of the mind. Marks that draw themselves. I am curious. I find myself in the studio these days. There is something affirming about creation. Even in making the slightest wonder or tweak. I made, therefore I was. I make, and I am. I make, and I am again. And again. And again. I think everyday is like a new day for me. I know for a fact that Hannah is coming down more often now a days [sic]. I know this because I find that I have not made shopping lists for the last two weeks or so. And if I have not made shopping lists then I have not went to the market for some time. I would complain, but I do not think I am in a position to do [sic] anymore. Coughing more. Hannah says that it is the dust from the studio air. We compromise and she helped me move some of the things out into the living room, where there is more light. I am scared because I cannot find some of the things any more. Hannah is worried for me. She says I called her last night, and that I was very frightened that I was inside my house, and that I was all by myself. It is rubbish. I am not scared of the house. The house is not scared of me. Pottery is not scared of the mold it emerges from. I am finding more things in my house, and not finding others. But if they are in my house then I must have made them, or lost them. The house tells me that this is true. but I do not think the house has lost me.